If we say the word ‘Iceland’ many of you will instantly conjure up images of stunning natural beauty, hauntingly quiet lakes, lost castles and (if you’re reading this at lunchtime) delicious fish dishes. 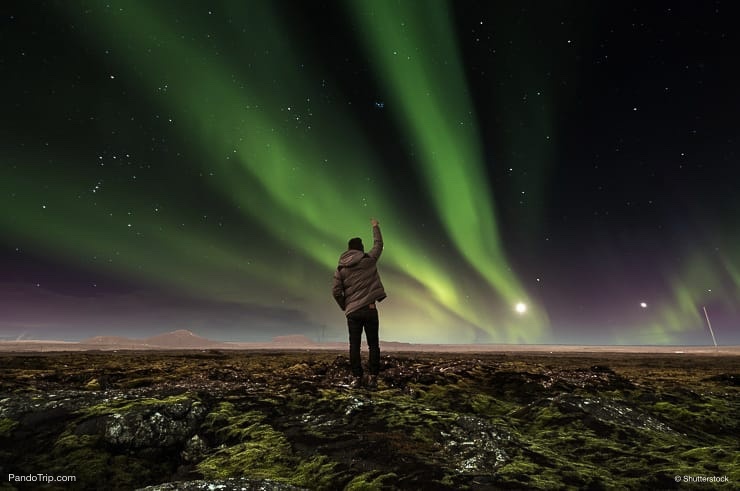 But, there is plenty more to discover in Iceland, so we thought we’d take you on a whistle-stop tour of the top ten things to see and do. Ready? Iceland could very well be one of the best places in the entire world for whale watching. In fact, the whale-ultra-celeb, Keiko from Free Willy, was captured in Reyðarfjörður Fjord, Iceland. Keiko was a Killer Whale but there are about eleven species which are regularly sighted year-round. Iceland’s best spots for whale watching. Although whales can be spotted all along the coast, there are three stunning main locations for whale watching tours. Húsavík is Iceland’s premier destination for whale watching. This small town has only 182 inhabitants and is surrounded by rolling green hills. If you’re there be sure to visit the Whale Museum. Eyjafjörður is the longest Fjord in Iceland and Reykjavík, the capital, has a friendly, colorful and welcoming feeling that you’ll love! Best time to visit? You can see whales at any time of the year in Iceland but the best period is during summer (June-September) when the warm seas are abundant with krill and fish. The peak time is June to August, so be sure to book in advance. Imagine this, you’re sitting on the shore of a gentle lagoon as the crystal clear water laps at your toes, a flat black sand beach that you are sitting on stretches out before you and one of the most stunning peaks of Iceland dominates the view. Vestrahorn, a 454 meter (1,489 foot) tall screen mountain is definitely one of our top spots to visit during your trip to Iceland. Why go there? To capture this awe-inspiring landscape on camera, due to its rural location, it isn’t crowded so you can capture amazing shots tourist free. If photography isn’t your passion don’t worry, you’ll enjoy strolling along the unique black-sand beach, petting the Icelandic ponies and if you’re lucky you might even see a few seals. Best time to visit? Open all year but, remember in Winter that it will be both cold and icy so be prepared for a somewhat difficult trip. You’ll be rewarded with snowy peaks, icy-black reflections on the water and moody skies. Not only are geysers great fun (hands up how many of you have jumped with surprise when a geyser currently erupts), but they are also a fairly rare natural phenomenon, only about 1,000 exist on the whole planet. Where to go? The ancient Great Geysir is located in Haukadalur Valley, 90-minutes drive from the capital, Reykjavik. Although for now, this sleeping giant is classified as dormant the Great Geysir was the first European Geysir to be discovered. In fact, when active, it shoots boiling deep water up to 70 meters (229 foot) in the air. Not far from the Great Geysir is the restless Strokkur Geysir which erupts every few minutes! Although smaller in eruption size, at just 20 meters, you’ll be able to watch it a few times during your visit, we still jump every time it does though. Iceland is home to many magical landscapes from its multicolored mountains, meandering lava trails, crystal clear lakes and calming hot springs. But, where can you find all of these incredible natural phenomena in just one area? The answer, of course, is Landmannalaugar. You might be wondering what makes the unique colorings of the mountains as they stand proud against the skyline. The peaks are made a mineral-filled lava called Rhyolite, which, as it cools unusually slowly it creates splashes of rainbow colors. Also, one of the best hikes in Iceland – Laugavegurinn (which takes in rainbow-colored hills to jet-black volcanic deserts, mystical ice caves, and luscious green valleys) starts here. Laugavegurinn Hike. A challenging 34 mile (55km) hike where the landscape morphs into steaming and bubbling hot springs all along the route and the colors run wild through the mountain peaks. Book a full four-day tour to do the trail and really explore the area. It can be quite a difficult hike so make sure that you are fully prepared. Best time to visit? Landmannalaugar is only accessible in the Summer months, from June to September. For the rest of the year, the roads are closed. This white concrete church was designed by Guðjón Samúelsson in 1937 and can be seen from anywhere in the capital. Surprisingly, its design took inspiration from the volcanic basalt pillars that are dotted across Iceland’s countryside. Why go there? Atop of the hill, with his back to the church, it seems that the statue of Leifur Eiríksson, Discoverer of America, is standing guard. There are great views from here, but take the lift next to the main door of the church and you’ll be whisked up to the viewing platform and rewarded with panoramic views over the capitals bright rooftops and beyond. You could take part in this evening tour which will take you around Reykjavik and the surrounding area to discover much more history and folklore. Best time to visit? From mid-June to mid-August there is a roster of activities in the church, from Choir Concerts, organ recitals on the 5000-pipe organ and Sunday services. Some of the activities have a charge so check online before you turn up. This dramatic coastline offers a majestic glimpse into the ferocious power of nature. As the sea gushes below you with turbulent waves you can stand atop this 120 meter (393 foot) coastline and, quite simply, enjoy the view. If you’re feeling a little bit like a daredevil then you can walk the archway and stand at, what seems like, the edge of the world. Why go there? The simple answer is: for the incredible views in all directions. Looking out North you’ll see the bewilderingly large Mýrdalsjökull glacier (Iceland’s fourth largest ice cap), turn eastwards for the interesting Reynisdrangar rock formations and to the west, your gaze will follow a seemingly endless black sand coastline. Best time to visit? The area is a designated bird sanctuary, primarily for puffins and arctic terns. As such, its part closed during nesting season in May and June. The exact dates vary from year to year. In the depths of Vatnajökull Glacier, there is an ever-shifting, ever-changing, colorful icy world just waiting to be discovered. If you ever thought that Elsa from Disney’s ‘Frozen’ was cool, then you will love this place. Where to go? Vatnajökull Glacier, at 8100 km2, is Europe’s largest glacier and covers a whopping 8% of the country. Deep maze-like formations are created every year and are best explored with a guided tour. Is it safe to visit the caves without a guided tour? Regardless of how experienced you are, we would recommend taking a guided tour. No one will stop you from entering, but the caves are constantly shifting and it is best to have a well-trained eye to ensure your safety. Best time to visit? Ice cave season is from November through to March, when the weather has been consistently cold enough for the caves to be deemed stable. Once considered to be the glitter of Valkyries taking dead souls to the afterlife, these magical lights are still one of the wonders of the world. Actually caused by solar particles entering the earth’s magnetic field and being drawn to the North Pole we all know that you need good planning and luck in order to see them. In Iceland, they are visible almost 8 months out of the year and unlike other countries, there is less cloud cover which means that your probability just went up a notch! Best time to go. Between October and April, with peak visibility from December to February. There is a simple formula to see them: complete darkness + no moonlight + no/part cloud cover + being at the right time in at the right place. There is no definite way to forecast the activity of this natural kaleidoscope, although there are a certain number of apps and websites such as Vedur to help with your planning. Best way to see the Northern Lights. There are a few different options to go Northern Light hunting. Firstly you can sit still in the town that you’re staying in and hope for the best. This might not be the best option as light pollution seriously affects your chances. You could get active and head out to a remote spot either on your own or as part of a guided tour. There are many tours running from Reykjavik and Akureyri. Your third option is to see the Northern Lights from a boat tour such as this one from Reykjavik. Iceland has enough geothermal waters to satisfy everyone’s desires. So, what better way to enjoy Iceland than to join in! There are hot springs across the country, from the largest town to the most remote location, one of the most famous is the Blue Lagoon. Blue Lagoon. Stepping into the Blue Lagoon area will make you feel like you just stepped into a fairytale. The strangely colored bright blue waters due to the large amounts of silica and sulfur lap against the jet black volcanic rocks. Just remember to make sure that your camera has enough battery you’ll need it! Blue Lagoon Alternatives. Now, the Blue Lagoon is just one of many options (and it’s quite expensive). So, be sure to look into some of the alternatives such as the remote and peaceful Myvatn Nature Baths, Landmannalaugar which is free and therefore, busy with other tourists, or the oldest man-made hot spring Seljavallalaug. Iceland is known for its vistas of astounding beauty and over 10,000 of these sites include waterfalls. From Bruarfoss which is just 3 meters (9 foot) tall to Morsi Waterfall which tumbles from 240 meters (787 foot). A trip to Iceland just isn’t complete without gazing at these stunning sites. The best waterfalls to visit in Iceland. You’re spoilt for choice, so for the best of the best read our article on the best waterfalls in Iceland. We think that Skogafoss, Seljalandsfoss, and Gullfoss should be top of your list. Actually, you might recognize Skogafoss waterfall, with its bright green banks from the Walter Mitty movie. 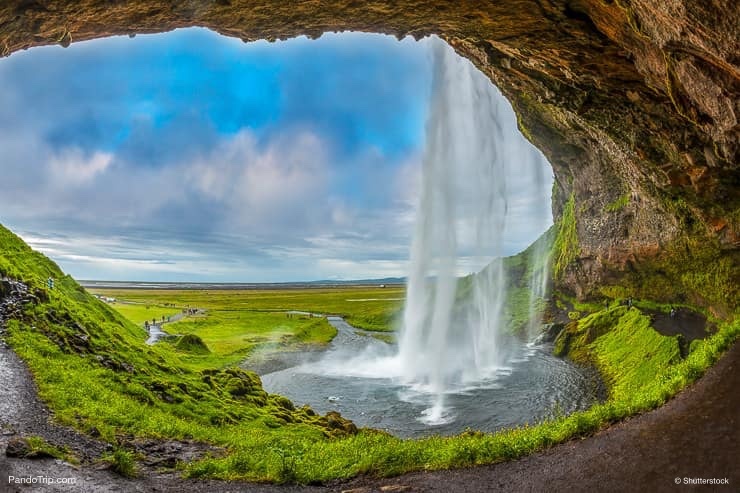 You can creep behind the watery curtain of Seljalandsfoss waterfall and discover what secrets it hides, whilst Gullfoss is a large traditional two-tiered waterfall. Want to see more… get packing! We know, we’ve gotten you all excited about your trip to Iceland. There is so much to see and do that we had difficulty picking out top ten favorite things. We hope we’ve inspired you, given you a sense of wanderlust and helped you plan your trip!